Now is a perfect time to fill out your Total War collection. The Humble Store is running a sale on the whole series, with deep discounts on some of the best titles in the long-running strategy franchise. Of particular interest is Total War: Warhammer II and its DLC packs. Total War: Warhammer II (check out our review here) is 66% off, putting it at $20.39 USD or £15.64. You can pick up also grab the excellent Rise of the Tomb Kings expansion at 50% off, and the newer Curse of the Vampire Coast expansion is available for 20% off. The original Total War: Warhammer is a full 75% off, so you can grab that for $14.99 USD/£11.50. Its DLCs Call of the Beastmen, The Grim and the Grave, Realm of the Wood Elves, The King & The Warlord, Chaos Warriors Race Pack, and Norsa are all 50% off. It’s worth reminding potential players that owning both Total War: Warhammer games opens up the Mortal Empires campaign map, which fuses both games’ maps and dumps all the factions into it for a truly massive (and chaotic) grand campaign. Humble’s Total War sale also covers many other titles in the series. Both Total War: Rome II – which is now arguably among the best Total War games ever – and Total War: Attila are 75% off, with many of the culture packs and additional campaigns discounted 66%. Total War Saga: Thrones of Britannia is also half off, and some of the series’ older games like Total War: Empire, Total War: Shogun 2, and Napoleon: Total War, are 75% off. If you’ve been on the fence about getting into Total War, this sale is a great opportunity to take the plunge. 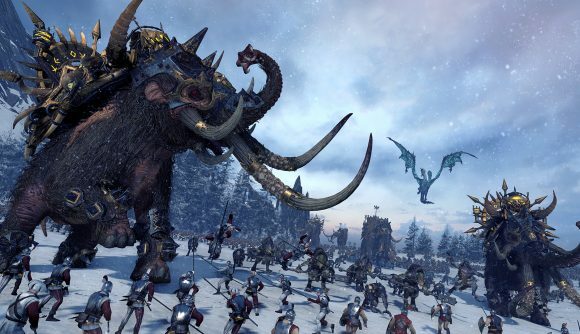 The Warhammer games in particular have made the series more accessible than ever, and the addition of Games Workshop’s giant fantasy monsters opens up the games’ real-time battles to wildly entertaining new tactics and spectacle. Of course, Total War: Three Kingdoms is due out next month, which will finally take the series to feudal China to explore alongside the many characters of Romance of the Three Kingdoms.